Billy is a lifer - not in prison but in a care home. He has just turned fifteen and he's angry - oh boy, is he angry. His fury blazes out from every page. Billy is not easy to like, or not at first, anyway. Not if you are a middle-aged woman like me, brought up in the 1960s in a family who gave you all the love and security you ever needed. After the first few pages, I wondered whether Billy and I were going to get on. But slowly, Phil Earle led me into Billy's world and I started to get glimpses of why Billy is the way he is. Nine years of institutional living, for a start. An attempt at being fostered by a family with an eye to adopting him, which all went disastrously wrong. Before that, an alcoholic mother with a partner who physically abused Billy. This young man has many reasons for being the way he is. Billy's redeeming feature is that he loves his younger brother and sister, the ten-year-old twins, Louie and Lizzie. He will do anything to protect them and keep them from harm. He'll beat up anyone who tries to hurt them. He stands guard outside the bathroom-without-a-lock while Lizzie is inside, reads them bedtime stories and tucks their duvets round their feet at night to keep them warm. Care home worker Ronnie is on Billy's side or wants to be, if only Billy would let him. Ronnie goes to great lengths to help Billy sort out his life, but Billy's having none of it. It's not till he meets Daisy, a girl from a similar background to his own, that he begins to thaw out, just a little bit. There's talk of the twins moving back home to live with their mother, leaving Billy behind in the care home. He hates this idea, both for their sake and his own, though with Daisy and Ron's help he finally starts to come to terms with it. But that's only the beginning of further trouble. Billy will have to dig deep to find what he needs to help his brother and sister now. Books don't often make me cry these days, but my eyes were wet at a couple of points in the reading of this one. Phil Earle knows what he's talking about. The introduction says he worked in a children's home and moved on to train as a drama therapist and worked in a community in London caring for traumatized adoloscents. All that experience shines through the novel. And Phil understands Ronnie as well as Billy, that's very clear. Young readers may well identify more quickly with Billy than I did. When I finally 'got' him, I was ashamed it had taken me so long. From the outside, I would have dismissed him, for sure, as yet another troublesome and violent young lad. I'm sorry, Billy. I understand you a bit better now and I see how I could easily have been you or Daisy if I'd experienced the kind of things you did. Well done, Phil Earle. 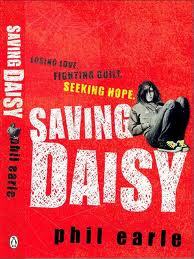 I see you have a new book out, called Saving Daisy. I hope it's the troubled Daisy, Billy's friend from the first book. 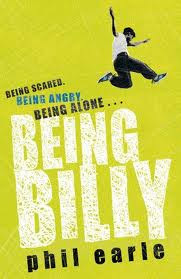 I'll be reading it very soon, anyway, and I'll be recommending Billy to everyone who crosses my path. Sounds like a brilliant read and one that I would recommend to teachers to read to help them gain an insight into the difficulties 'looked after' children and young adults face and how it affects their behaviour. I imagine it will be great for some children to see their lives validated in stories. Good point that it would be useful for teachers to read. And for kids who have lives like this. I loved Being Billy, and I'm not ashamed to say it made me a bit misty-eyed at times. I volunteered in a kids' home for a while in my twenties, Rosalie, so I guess I got Billy a bit quicker than you did - it was really interesting to read your perspective. Thanks! Yes, I think a good book should always be a journey for the reader (as well as for writer and protagonist) and this was one for me. I like the concept of your blog. Very original.